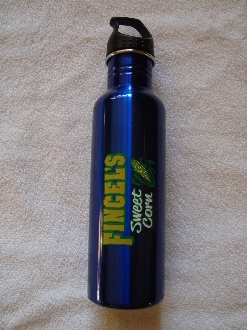 Cool off and keep hydrated with your Fincel's Sweet Corn 25 oz. Stainless Steel Water Bottle, in Blue. It features a screw-on lid, wide mouth top for ice cubes, and loop top that can be attached to a backpack or belt loop using a carabiner. Sip with Fincel's Sweet Corn pride! info@fincelssweetcorn.com Copyright © 2011-2019 Fincel's Sweet Corn. All rights reserved.